The Helix sets our faces to stunned. Mini next, please, TC! Vintage mode nails Phase 90-style tone. TonePrint custom settings. Great build. 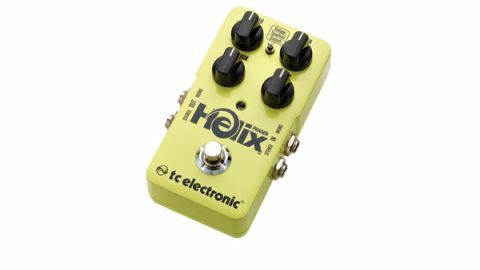 The TonePrint line has long been missing a couple of crucial mod effects from its roster, but this year, TC has set out to right this wrong with the Helix Phaser, which packs in analogue dry-through, stereo inputs and outputs, plus, of course, TonePrints themselves. "Unlike many multi-mode phasers, it doesn't sound digital, with midrange peaks in all the right places"
Digital phasers released over the past decade or so have been hit and miss, but the Helix's vintage setting is a near dead-on Phase 90 impersonation. Unlike many multi-mode phasers, it doesn't sound digital, with midrange peaks in all the right places - up the depth and feedback control and it'll drive your amp hard. Flick over to the smooth setting, and while the sweep's peaks and troughs are smoothed out, the phasing effect is more intense and vocal, with borderline pitch bends - think the 'wow-wow' warbles of the rare Ludwig Phase II on Sonic Youth's The Diamond Sea, then crank everything to full, and rate to minimum for Mike Einziger's 12-stage Boss PH-2 sweeps. TC's TonePrints give you even more versatility, from John Petrucci's subtle Alex Lifeson impression to Guthrie Govan's wah-like Thing. You can run any of these sounds pre- or post-distortion in your chain; the mix control and analogue dry-through always keeps your original tone in check.